As we quickly approach the month of October, much Halo goodness lies ahead. In the coming weeks, we’ll detail new features, including ones you haven’t yet seen. We’ll talk about Halo 5: Guardians playlists and game modes, and much more. You’ll see more sneak peeks at the story of Halo 5, as well as things like the REQ System, Spartan customization, and much more. We know you’re anxiously awaiting these details and more, and they will come in due time. Before we move on, I wanted to extend a special thanks to those of you who have provided your overwhelming and tremendously helpful MCC playlist feedback on Waypoint, Twitter, and r/Halo – the playlist team is evaluating your input as they work towards their next update, which I’m looking forward to discussing in the near future. Today, we’ll talk about Halo: Last Light, which drops in just four days, Warzone level progression, which will help detail the flow of a match, and more. Let’s get to it. If you’re like us, and still want more, click here for a preview of the text. Lastly, Troy was nice enough to send over 10 signed copies of the book, and we’d like to give them away to you. While we often hold giveaways on Twitter and the like, it feels like this one should stay close to home, so we’re giving the signed copies away right here on Waypoint. To enter, simply stop by this thread and make a post to digitally drop your name in the hat. For more on the latest universe developments, be sure to head over to this week’s Canon Fodder: Infinity & Beyond. 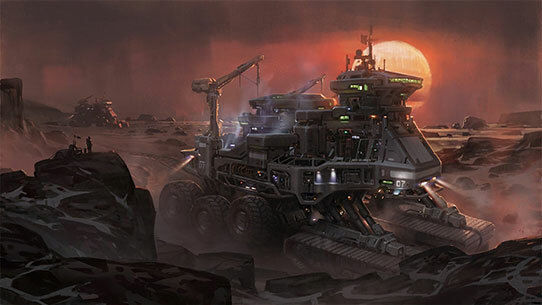 In the not-too-distant future, we’ll be talking more about the REQ System and the contents contained within. To prepare you for these info drops, this week we’re covering the REQ Level Progression system in Warzone. To help detail these systems, I grabbed designers Lawrence Metten and David Ellis, who are much more qualified than I am to give you the scoop. Take it away, gentlemen, before I say something entirely incorrect and terribly misleading. In-match progression was one of the first things we built when we started prototyping Warzone at the beginning of Halo 5 development. 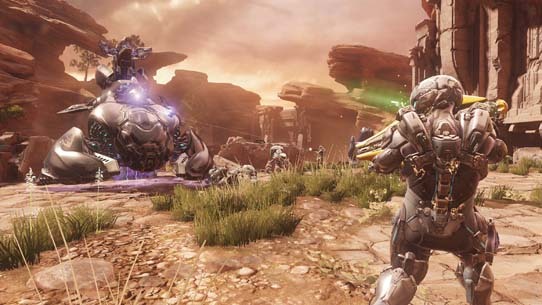 We wanted Warzone players to feel their strength and available arsenal evolving over the course of each Warzone match. We also needed a system to prevent players from calling in game-changing power weapons or vehicles too early into each match. REQ Level is displayed in a bar at the bottom of the HUD. Medals, like Caster Kill and Warthog Destroyed above, feed into the bar to progress REQ Level. We landed on the REQ Level Progression system. Players start each match at level 1, and progress through a maximum of nine levels as the game advances. Great players may only take 12 or 13 minutes to hit max level, but players ignoring objectives or playing poorly will hit 9 much later, or potentially not at all. A higher REQ Level means more REQ Energy which is used to redeem weapon, vehicle, Powerup, and Armor Mod REQs. Boiled down, the higher your REQ Level the more powerful the tools you have at your disposal. REQ Level is represented by a bar at the bottom of the HUD. Medals feed the REQ Level bar; earn one for a specific kill, base capture, Boss Takedown, or more, and it’ll progress your REQ Level. Observant Halo fans have already noticed that certain Kill Medals are awarded in Warzone but not Arena. This is intentional, as all Medals in Warzone have a REQ Level reward associated with them and provide essential visual feedback for level progression. 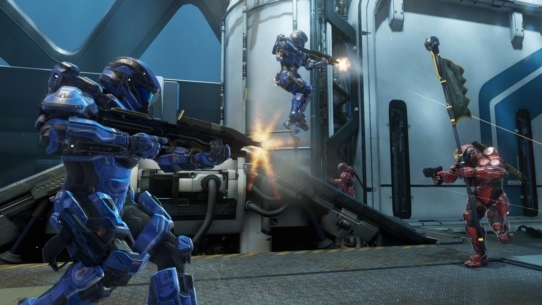 When you earn a Kill or Objective Medal, you’ll earn progress towards your next REQ Level. To reinforce that Medals feed into REQ Level, we’ve actually split out Medals like Halo 4’s “Vehicle Destroyed” into vehicle specific destruction Medals to provide clear feedback that we’re awarding different REQ Level values based on which vehicle was destroyed. Below are some of the new Medals players will be earning in Warzone. Medals aren’t the only thing that can progress your REQ Level, though. Many objectives award REQ Level progression to all teammates when completed. If you see your REQ Level increasing as you play, it’s likely that teammates elsewhere in the environment are capturing bases and eliminating Bosses. One of the best ways to progress your REQ Level in Warzone, as well as advance your team towards victory, is by going after the AI Boss adversaries. One of the deadly AI enemy types you’ll be facing off against in Warzone are Bosses. Throughout the course of Warzone missions, Bosses will enter the battlefield, ready to melt the helmets of unsuspecting Spartans who dare challenge them. Bosses come from a variety of enemy factions, and at first glance they may seem familiar, but expect a bigger challenge than you might expect. These adversaries are the best of the best, decked out in heavy armor and wielding the baddest weapons. 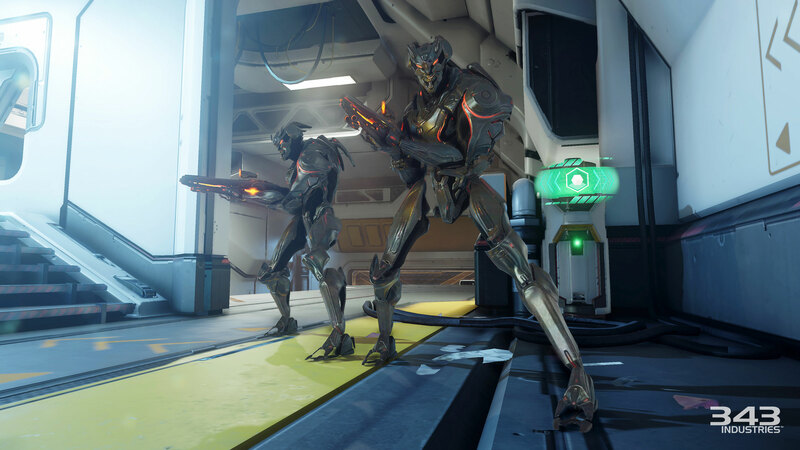 In addition to awarding Victory Points, Boss Takedowns progress the REQ Level of all teammates involved in the kill as well as awarding a small bonus to all members of the team. These fearsome foes come in two categories: Bosses and Legendary Bosses. Worth 25 and 150 Victory Points apiece, Boss battles quickly become frenetic firefights filled with teams looking to land the killing blow, earning all the rewards. For context, taking out a regular Boss is worth the same as eliminating 25 Spartans on the other team! If you’ve had a chance to play Warzone or watch any of the match footage from E3, gamescom, etc. you probably blinked when you saw 150 Victory Points for a Legendary Boss takedown. After extensive playtesting, we decided to lower that payout from 200 Victory Points to help balance the overall in-game point spread between base retention, killing Spartans, and taking out bosses. Before this change, the metagame had kind of turned into, “Let’s just kill bosses and win,” which is only part of the overall effective strategy for winning at Warzone. Minion AI defend bases and fight alongside Bosses. Eliminate them to progress your REQ Level. Level rewards for Minion kills are small but they add up! It’s worth mentioning in addition to Victory Points, Boss Takedowns significantly enlarge the REQ Level for everyone assisting in the battle, not just the killing player, while also offering a smaller bump for remaining teammates. That’s right, we don’t just reward the player who landed the kill shot. This REQ Level bump is based off of the perceived difficulty of a boss. For example, a Knight Boss is going to raise your REQ Level more than say, an Elite. As Lawrence said earlier, your REQ Level determines what REQ cards are available for you to use. So, if you want to use your Scorpion tank card ASAP, you probably want to help take out Bosses. Not only does your team gain Victory Points, but now you’re cleared to use those higher level weapons and vehicles that weren’t available prior to the Boss Takedown. Defending bases and occasionally joining Bosses are weaker AI we affectionately refer to as Minions. Minions primarily defend their leaders by focus firing on any threats that come their way. Don’t sleep on the Minions. Taking them out first provides two benefits: it allows you to remove the Boss with fewer distractions, and Minion deaths offer a slight REQ Level increase to anyone who helps out in the fight. Teams who aggressively take out bosses in Warzone set themselves up for success. Here in the studio, we’re constantly seeing players attempt new strategies like sneaking behind enemy lines to take out Bosses or saving that rocket launcher barrage until the Boss’s health bar is almost empty. We can’t wait ‘till everyone reading gets a chance to find their own unique strategies for success in Warzone this October. Celebrating the “top” play of the week has become an all too enjoyable tradition. This week, we spotted a clip from a classic Halo 3 custom map and game type, and one of the first that was remade within MCC. In this week’s play, a sneaky Delpoyable Cover is launched at the Jenga tower, and does an uncharacteristically large amount of damage – sending the concrete dividers flying. A Spartan by the name of Well Rested slips from the wooden palette, but unlike other Spartans who have fallen to the depths of the skybox du Standoff, he looked down, and spotted a fellow Spartan who was making a last ditch effort to desperately grab hold of one of the relics of Tsavo Highway. While many players may have given up at this point, he instead jumped straight off of the player's head, and lived to tell the tale. Well done, Well Rested. If you’d like to play some Jenga yourself, you can watch a quick clip here, and download both the custom map (Jenga Tower v3) and game type (Jenga Bop) from the File Share: I Play Hockey using the “Find Player” search. Before we go, we also got quite a kick out of Duji's Sticky Detonator Trolltage, which is a near-10 minute glimpse into the psychology of Halo players (particularly those stuck with a Sticky Det), and possibly the most dedicated, specific look at a Halo weapon we’ve ever seen. Give it a watch here. Exciting times lie ahead, and I look forward to digging into the details with you over these next weeks. Hello friends! PAX Prime is upon us, which means that we’ve got long days and long nights ahead, and hope to spend many of them with many of you. Due to the holiday weekend, we’ve got a quick update this week, but we’ll talk about a new Halo 5 Arena map, the latest MCC playlist update, and more.